Sponsor 100 people into ANY Network Marketing opportunity… in 30 DAYS or LESS! If you’re involved in MLM and you do not take 7 minutes (YES, I’ve timed it!) to read every word of this website, it will be the biggest mistake you’ll ever make. 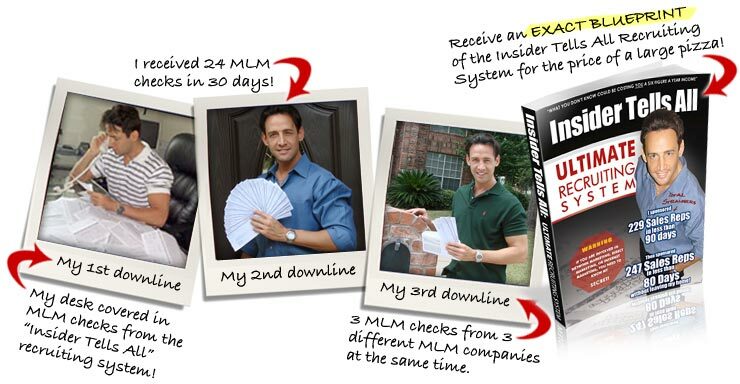 87% of Networkers never receive one single check, and the “Insider Tells All” recruiting system has my home office desk covered in MLM checks from three different MLM companies! Within days of discovering this incredible recruiting system, I had HUNDREDS of people, who were complete and total strangers, listening to my MLM sizzle call every week! I didn’t even have to pick up the phone or say a single word to get them to do it. As you can see from the pictures above, I have used this simple and powerful recruiting system to build three separate downlines with three different MLM companies which each had three totally different product lines! My name is Mike, and the recruiting system that I am about to reveal has allowed me to go from being a guy that was too embarrassed to tell anyone how many people I had in my downline to being THE GUY ON-STAGE, receiving awards and getting paid as much as $500 PER HOUR from Network Marketing CEO’s to speak at their standing room only events. Within months of discovering this recruiting system, I was featured on a 30-minute TV show about how to build wealth from home. It was seen by millions of people! It all happened so FAST and I owe it all to this recruiting system… the VERY system that I am willing to share with you for the price of a large pizza. 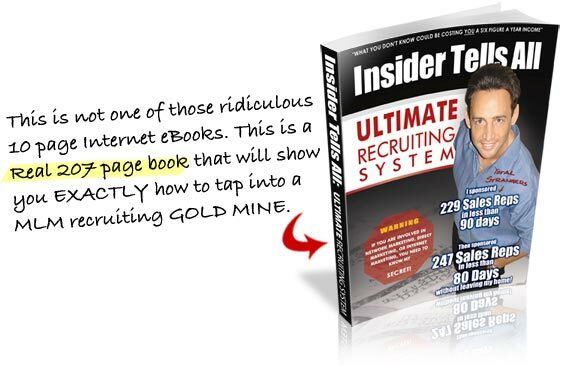 You will be shocked and amazed when you see what I had to go through to discover this recruiting system. You’ll quickly see that no matter how hard I worked or how much money I spent, discovering this system was the result of PURE LUCK!!! I’ll admit it…I got lucky and now IT’S YOUR TURN! I had been involved in MLM for almost three full years and had spent nearly $22,000 of my hard earned savings before I got lucky. The reason I was able to dedicate so much time and money to my Network Marketing Business was because I owned a successful vending business (you know… soda machines). I had 72 soda machines all over the Houston area and was making a pretty good living. My home was almost paid off, I had just bought a BMW, had a motorcycle and even a boat that I kept at the lake. This was back around 1991. There was just one problem. I had ZERO time to enjoy any of it. I filled soda machines from sun up to sun down, six days a week. I was burned out and ready for a change in my life. I sold my vending company and started my Network Marketing Career. Selling my vending company gave me the time and money to dedicate 40-50 hours a week to my new MLM business. I did everything my upline asked of me. I had home meetings, talked to everyone within 3 feet of me, bought hundreds of dollars in samples and handed them out like candy. I was shocked when it didn’t work. I just knew for sure that it must be the company I was with! So, I joined a different MLM company with a totally different product and started all over. Once again, I listened to my upline, did the home meetings, followed the 3-foot rule and handed out hundreds of dollars of product samples. Again, IT DID NOT WORK! Sound familiar? It has now been almost two years since I got into Network Marketing, and I had not made a dime. In fact, at this point, I had lost about $10,000. I was now getting desperate. So, I joined my third MLM Company and truly believed that this time I was going to hit it big! At this point, I was finally able to realize that most MLM companies have a small group of people making $10,000 per month while most of the other people in the same EXACT Company with the same EXACT product were not making a dime! Why is that? Then, it hit me like a ton of bricks. It’s not the company or the product that determines if you’re going to succeed. It’s the recruiting system you use to build your business! The people that are making money in MLM have been lucky enough to stumble onto a simple recruiting system that works! I was now on the right track and hunting for a recruiting system that worked. I decided to make 500 copies of my MLM Company’s promotional video (which was not cheap). I then walked my entire subdivision hanging them on people’s doors. My thought was if I could just sign-up 10 people out of the 500 DVD’s, it would be worth all of the money I had spent. You guessed it. I didn’t sign-up one person. “That’s it!” I thought “I’m pulling out the big guns!” I decided to film a TV commercial. I actually think I was one of the first people in the U.S. to try recruiting people with a TV commercial. By the time the production and air-time was paid for, once again, I had lost money. This time it was BIG money! I had now been in Network Marketing for three full years, had not made a dime, and all I had to show for it was the $22,000 I had LOST. That was it! I had had enough. I was finished… DONE! That night I made plans to start another vending business. THEN IT HAPPENED! I got the phone call that changed everything. The gentleman on the other end of the phone saw my TV commercial on the VERY last night it ran. I GOT LUCKY! He wanted to meet me at his home to talk “business”. I thought, “GREAT. I’ll sign this guy up and it just might be enough to keep my MLM dream alive for another 30 days”. You should have seen my face when I pulled up to this gentlemen’s “home”. It was actually an estate complete with a red Ferrari parked right out front. I didn’t know it at the time, but I was about to meet one of the top direct marketers in the entire country. Now do you see why I say I got lucky, REALLY LUCKY? His estate also came complete with a full size movie theater, a 2-story night club, and not one or two, but THREE swimming pools. This home had even been seen on MTV MORE THAN ONCE! By the way, this is also a good example of what can happen when you have a good product backed by a proven marketing system. I got lucky, NOW IT’S YOUR TURN! 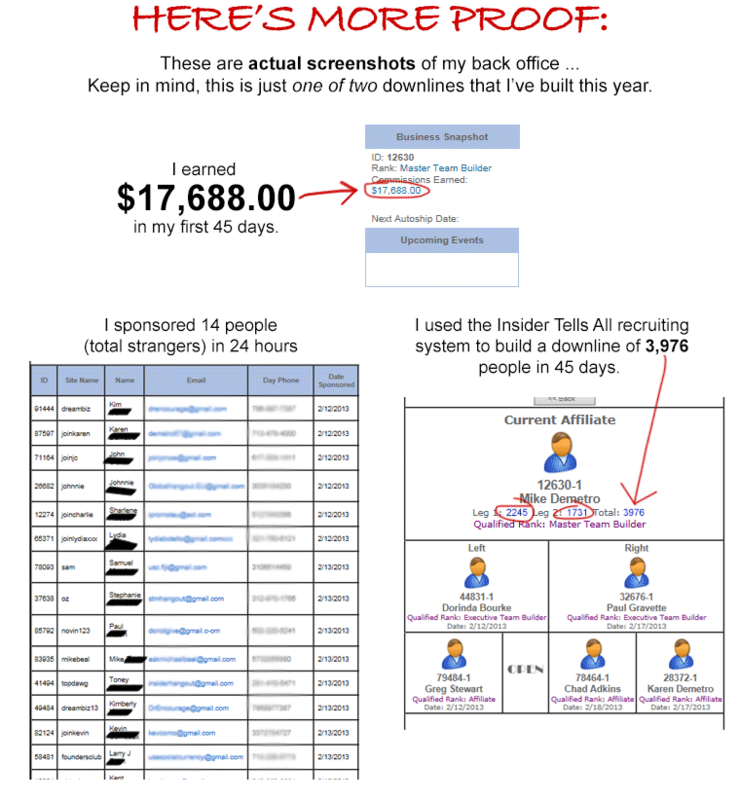 After discovering this simple recruiting system, I quickly became the #1 distributor in his entire company. The recruiting system was unbelievably simple. In fact, it was so simple I actually used it to build two other downlines in two separate MLM companies. Now I know it can be tacky to talk about checks, but when you are talking business, it’s the best way to see if something is working or not. 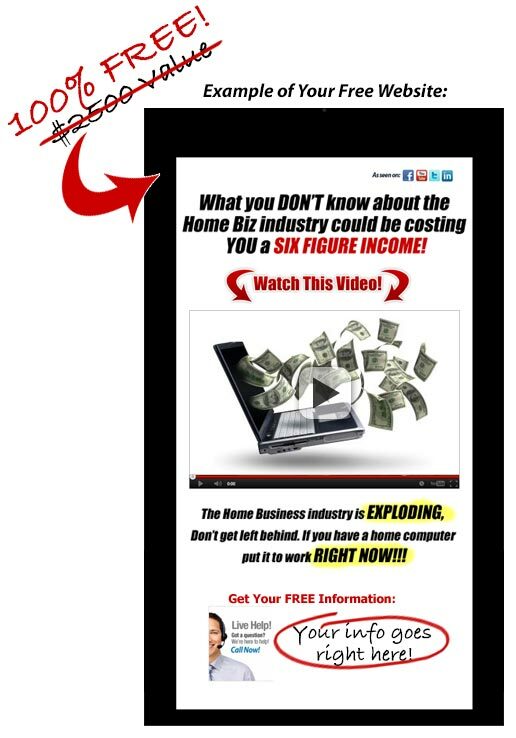 Within days of tapping into this simple system, I had people from all over the country listening to my MLM “sizzle call” and watching my MLM video and I didn’t have to say a single word. Think about that… If you had 100 or more people each day listening to your MLM “sizzle call”, what could that do for your business? EXACTLY!! IT GETS EVEN BETTER! in on the Best Recruiting SECRET EVER!!! Once you discover how to recruit and expose an MLM company’s opportunity and products to the masses you become very, very valuable to the entire network marketing industry. Since the release of the “Insider Tells All” book, I have actually been contacted by network marketing CEO’s from multi-million dollar companies who have offered complimentary flights, hotel rooms at four star resorts and FREE tickets to their events in hopes that I would join their company. Like I said, this is what happens when you have access to a recruiting system that has the power to expose MLM opportunities to the masses, which brings up a good point – do you think this book and recruiting system would be getting this much attention so fast if it wasn’t everything I say it is?? The reason this system is so powerful is because only a small handful of networkers in the entire U.S. even know it exists. Think about it. You just read my story. Look at what I had to go through in order to discover it! Don’t miss out! this website! You got lucky! Let me answer that question RIGHT NOW, so you can see this is 100% REAL! Like I said earlier, I have flown around this country and trained thousands of networkers and have made as much as $500 an hour to speak at Network Marketing events. I thought, why not write my entire system down, step-by-step, in an easy to follow book that anyone can follow? That’s exactly what I did! You get the SAME EXACT system that I use today! You get the SAME EXACT system I was paid $500 an hour to reveal! You get the SAME EXACT system that one man paid $2,000 to copy! You get it all for $24.95! This 207-page book, which I have titled “Insider Tells All” costs about $4 to print and sells for only $24.95. I make $20 profit on each order and sharing this recruiting system with you will not slow my personal MLM business down one bit. That’s why I’m willing to share it with you. I can create a second income stream without hurting my existing MLM business whatsoever. It’s that simple. I told you this would all make sense to you like any good business investment should. It’s a win-win for both of us. my proven recruiting system. I left NOTHING out. As you can see from the testimonials above some of your competition (other networkers) have already taken action and are using the “Insider Tells All” recruiting system to build their business. What’s crazy is the more popular social sites like Facebook, Twitter and YouTube get the more powerful the “Insider Tells All” recruiting system gets. YOUR TIMING IS PERFECT!!! 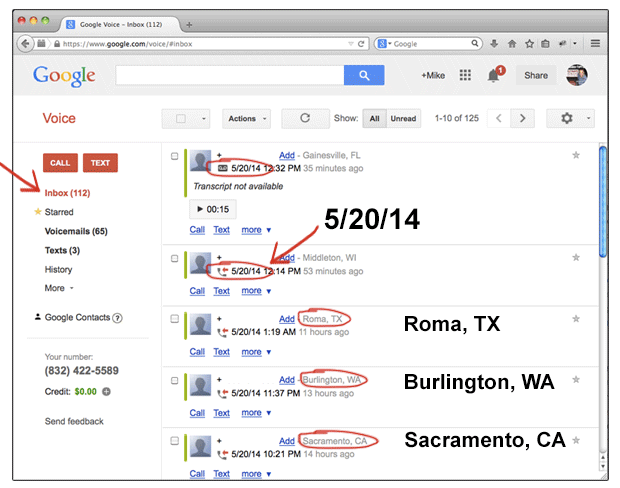 This is an actual screenshot of my Google Voice mail inbox for May 20, 2014. As you can see, I have over 100 message from total strangers from all over the US that want to know more about my Network Marketing opportunity. After reading my book, if you are not able to recruit 30 people into your MLM business within the next 30 days, simply return it…no questions asked. Think about it. I am letting you test my entire recruiting system risk-free. You have absolutely nothing to lose. Hands down, this is the strongest guarantee I have ever heard of. 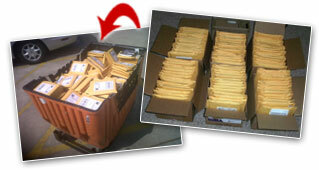 Within 30 days of receiving my book, if you do not feel that it’s worth 10 times the price you paid, simply return it. How can you lose with this guarantee? You can’t! I have just made this the most secure $24.95 investment you will ever make! I’m proud to announce at this point 3,127 copies of the “Insider Tells All” book have sold in just a few short months and not ONE SINGLE book has been returned. NOT ONE… In fact, people are referring this book to their downlines like crazy!!! In network marketing you have to accomplish two things to be successful, recruit new reps and customers for your business and train them to do the same. Training has never been easier… now that you have found this book. Which also brings up a good point… As you can see from the orders above, other networkers (your competition) have already taken action and ordered the book. Networking is a serious business and very competitive. When was the last time a networker with a proven recruiting system was willing to write it down step by step (The Book) and share it with you for the price of a pizza? Exactly, it sounds ridiculous, doesn’t it? But what I’m about to do right now will make this the most “OVER-The-TOP” $24.95 investment you will ever make for your MLM business! Within minutes of receiving your book, you could have your very own custom webpage complete with video shown below, absolutely FREE! A true $2,500 value! This website is a lead capture machine, and I’ll tell you right now…this offer won’t last long! All you have to do to receive your FAST START bonus is order your copy of the Insider Tells All book before the timer runs out. That’s it! If you were to build this website from scratch you could easily spend up to $2,500 due to the production cost of the video, and the actual building of the website. How do I know? I actually produced this video and webpage from scratch. And you get it just for ordering before the timer runs out. 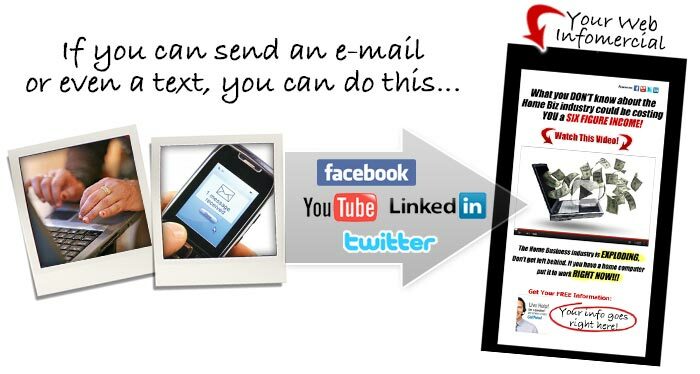 Also, within minutes of receiving your book, you’ll see step-by-step how I use this webpage and social media sites like Facebook and Youtube to turn total strangers into RED HOT, qualified leads that actually call Me to ask about my MLM opportunity! And the best part… I do it right from my home computer or even my cell phone without saying a single word! The KEY is the website and video. It does all the work. It’s like having a walking, talking billboard online working for you 24/7 even while you sleep. It’s a lead capturing machine and You can get it for FREE!!! That’s the good news… here’s the bad news. Since I paid web designers to build the webpage and produce the video, and I even pay to have everything hosted online… and the fact that all this money comes right out of my pocket is the very reason I’m only giving this custom landing page to serious people that are ready to take action right now! I’m only giving away a small, and I mean small, handful of sites for FREE! If you’re online at all, you know it costs money to host a website. Hosting two or even 10 web pages is no big deal. But if you’re hosting 50 or even 100 websites things can get very expensive very fast! The fact that I have over one hundred Networkers just like you per day visiting this website is the very reason this offer WILL END SOON! Don’t give your FREE custom website to another Networker… YOUR COMPETITION!!! But, (You guessed it) … It Gets Even Better!! The very instant that You order your book, You will be added to my monthly ‘Insider E- Report’ list and you will actually receive your FIRST report shown below within minutes via email and you get everything shown below just for ordering right now! 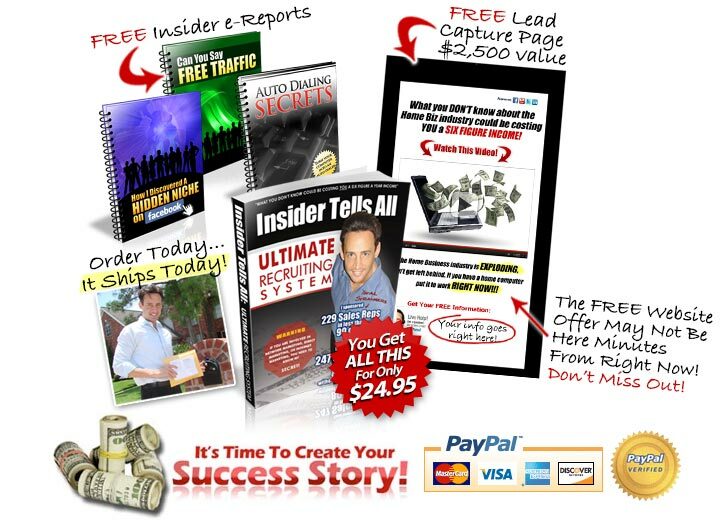 The “Insider Tells All” Book and e-reports was designed to put You in FRONT of the competition (other networkers), and the monthly ‘Insider E-Report’ was designed to make sure you STAY there!! Just look at the titles of the ‘Insider E-Reports’ that you’re about to receive. DON’T MISS OUT!! Missing just one e-report could cost you big! DISCLAIMER OF WARRANTY: The Creator of this book has used their best efforts in preparing this program. The accuracy and completeness of the information provided herein and opinions stated herein are not guaranteed or warranted to produce any particular results. The advice and strategies contained herein may not be suitable for every individual. The creator shall not be liable for any loss of profit or any other commercial damages. Please consult applicable laws and regulations and consult competent counsel to ensure your use of this information and material conforms with all applicable laws and regulations.